BlackArts Racing, a professional team which competes in the F3 Asian Championship, announced Vivien Keszthelyi as their official racing driver on Wednesday morning. The Debrecen-born pilot is the first in the history of Hungarian autosport, who represents her country in such a high-class international racing series at such a young age. Vivien will only have the chance to prepare during the tests that precede the first race, she will have to gain further experience in a tough competitive environment. Despite the fact that she has won her championship titles in the touring car category, next year Vivien Keszthelyi will enter the world of Formula 3 as the first Hungarian woman, and will try to compete with those mostly male pilots, who represent the international field in the category. By participating in the Eastern championship – at the age of 18 – Keszthelyi will be the youngest driver in the history of Hungarian autosport, who reaches the international Formula 3 category. It was made clear earlier this year that the young talent would have the chance to race in the formula category in 2019 as the only Hungarian qualifier of the new F3 championship for women drivers only, the W Series. However, nobody expected her to compete in Formula 3 as early as January. “We are pleased to announce that BlackArts Racing will start the 2019 season of the FIA certified F3 Asian Championship Winter Series with a highly talented, three-times touring car champion from Europe, Hungary in its ranks. Despite her young age, Vivien Keszthelyi (18) has proved several times that she has exceptional skills, and we are proud that she will take another step ahead, and start her career in the world of formula racing with us” – wrote BlackArts Racing in their official press release. Keszthelyi will face a difficult task. Switching to formula car is a huge challenge in itself, and it is even harder to start working right in Formula 3. Additionally, the Hungarian lady does not have racing experience in the category, as unlike most pilots, she did not learn the basics of racing on the kart track or in different formula car series. Her career began at the age of 12 and she started racing in the FIA certified Swift Cup Europe right away, from which she reached the Grand Touring category in just 5 years. 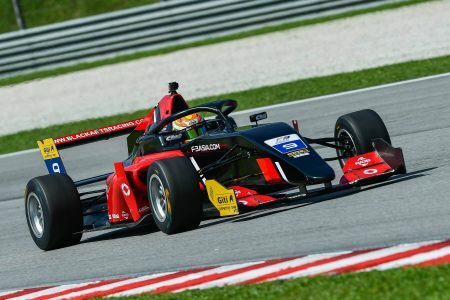 The FIA-certified Asian Winter Series, featuring Tatuus T-318 Formula 3 cars, is the perfect opportunity for her to learn, as the W Series – which has a 60 women shortlist with Keszthelyi as the only Hungarian pilot among other female racing drivers from 29 nations – will provide similar cars. With the support of former F1 pilot David Coulthard and one of the most successful technical designers of F1, Adrian Newey, the W Series is designed to bring the most talented female pilots to the highest-ranked category in motorsports, the Formula 1. The travel between Europe and Asia will be the biggest challenge for Keszthelyi, as she will often have to return from the Eastern continent due to her tight schedule. Additionally, if she gets chosen among the starters of the W Series, she will face further tests after the Asian championship. The time difference between the two continents as well as the 10-15 hour journey can be stressful for the human frame, but despite the difficulties, the Asian Winter Series will be extremely important for the Hungarian racer, as she would not be able to compete with her rivals who have significant formula car experience, if she did not get the minimal routine in the Formula 3 category. The championship’s calendar includes 9 races and the top 5 pilots will receive Super Licence points. The first race will be held on the 12th of January in Buriram, Thailand, where Keszthelyi will have the chance to do the first tests with the racing car provided by BlackArts Racing during the two days preceding the event. In 2019, Keszthelyi will take the first steps on the way to Formula 1, but in order to be successful in the world of formula car racing, she will need a lot of experience. The Asian Winter Series will be the first championship, where she can get the essential knowledge in a category that is completely new for her.